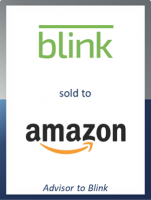 GCA acted as exclusive financial advisor to Blink, a provider of wireless home security cameras and monitoring systems, on its sale to Amazon.com (NASDAQ: AMZN). Immedia Semiconductor Inc. ("Blink") provides an indoor and outdoor camera system designed to protect the entire home remotely. Blink's wireless cameras send motion-activated alerts and high-definition video to consumers' smartphones. The company's proprietary chip technology allows it to produce a more efficient, low-powered and wireless camera with an industry-leading two-year battery life. Amazon's current connected home offerings include Amazon Key, Cloud Cam and Echo. GCA expects further consolidation activity in the area of home security and monitoring as new technologies and analytics enable innovative services.